The blank location map represents one of many map types and styles available. Look at Guelma from different perspectives. Blank map for all areas outside of the borders of Guelma. Maphill is a collection of map images. This image combines a blank map with the globe centered on Guelma. Use the buttons under the image to switch to different map types. Sure, this blank location map is nice. But there is good chance you will like other map styles even more. Select another style in the above table and see Guelma from a different view. Each map type offers different information and each map style is designed for a different purpose. Read about the styles and map projection used in the above map (Blank Location Map of Guelma). Outline maps, commonly known also as blank maps, indicate the overall shape of the country or region. Blank maps are often used for geography tests or other classroom or educational purposes. 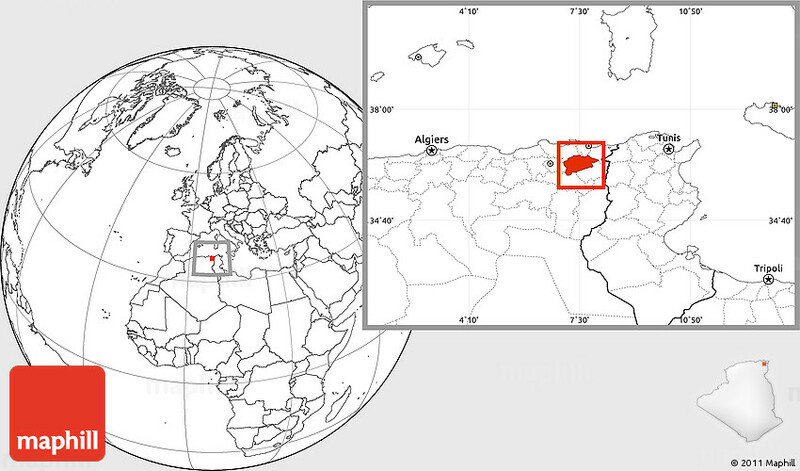 This blank map of Guelma allows you to include whatever information you need to show. These maps show international and state boundaries, country capitals and other important cities. Both labeled and unlabeled blank map with no text labels are available. Choose from a large collection of printable outline blank maps. All blank maps at Maphill are available in black & white printer-friendly format. It's neither this blank location map nor any other of the many millions of maps. The value of a map gallery is not determined by the number of pictures, but by the possibility to see the world from many different perspectives. Embed the above blank location map of Guelma into your website. Enrich your blog with quality map graphics. Make the web a more beautiful place.